Kanye West’s flirtations with the world of fashion have had mixed results, but his new Air Yeezy 2 Nike collabs? Nothing but net. West’s deal with Nike has him designing a pair every two years, and after 2009’s Air Yeezies sold out in record time, sneaker freaks have been anticipating the second installment of the Nike Air Yeezy which will release globally June 9th. Slimmer and more stylish than the Air Yeezy 1, these kicks are a hot commodity! Get them in the all-white “Platinum” look if you’re not worried about scuffing, or in black with pink accents…our kind of style. 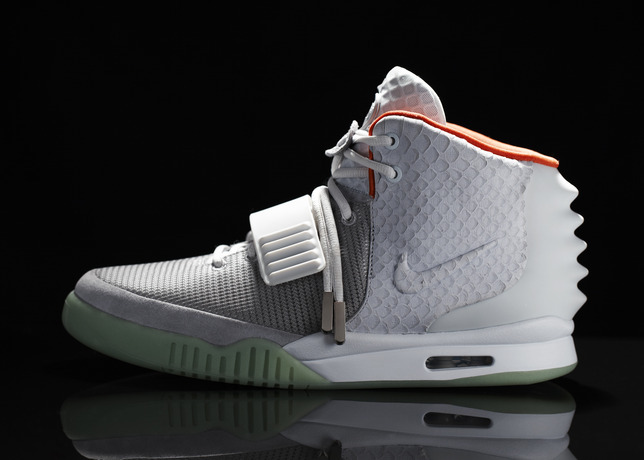 The Air Yeezy 2 will be available in France first (for all you Gold Diggers who can fly to Paris at a moment’s notice) but hit globally on Saturday. As we reported yesterday, we’ve seen reports of these kicks going for up to $90k online already. Nike is only releasing 100 pairs in each size, so if you’re lucky enough to get your hand on a pair, consider yourself ballin. This entry was posted in Fashion and tagged #2, Air Yeezy's, fashion, kicks, NIKE, shoes, Sneakers. Bookmark the permalink.